This week's Next 20 community builder is Caroline Carter, a master of communications, storytelling and thought leadership. A former reporter and journalist, Caroline is a new entrepreneur with her company, CSuite Content. Her diverse background includes stints in radio, newsrooms, boutique PR agencies and technology start-ups. In her spare time, she moonlights as a stand-up comedian. What have been some key influences in your life? I spent a good part of my twenties as a radio journalist in Whitehorse, Yukon, where I produced and reported on diverse Aboriginal content segments. I was so inspired and moved by the stories I heard coming out of the communities I was working in, and was both honoured and humbled to be a part of others getting their important message out. I hear "creativity" and think "essential". Creativity is a form of communication, a reflection of the world and a way to connect with others. Creativity is essential in finding solutions to the challenges our generation is currently facing now and in the future. What does creativity look like in your professional and personal life? A huge milestone is realizing I can actually do creative work in a business context. 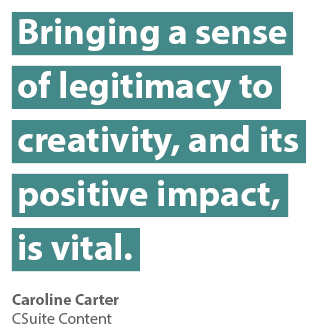 My company, CSuite Content, helps executives tell compelling stories. Even though creativity is part of what I do professionally, I consciously make room for it in my personal life and in my relationships. I do stand-up comedy in my spare time and my partner and I also recently took an improv class together. I think creativity is like exercise: it's good for you, so I seek out opportunities to nurture my creative spirit. What inspired you to take the leap and start your own company? I am surrounded by entrepreneurs! I also saw traditional media and PR shifting so much; while some doors were closing in terms of media outlets getting smaller and journalists being strapped for time, new opportunities were emerging for storytelling, branding and publicity. I now help executives become the journalists and publishers themselves. My business helps executives tell stories about their industries and their businesses in their own words rather than waiting for a reporter to cover a story. What do you think inhibits the development of creativity? Fear. Before I do stand-up, I'm always petrified. Once I'm on stage, I find flow. But until that moment, there is the fear of being judged. I attended a rigorous arts program at Lord Byng High School. Half of my day was spent studying theatre and the other half was academic. In school, everyone is performing and playing a role to fit in. For me, theatre was where people could try on different characters without judgement. It was a beautiful space for connection and tension release. So I think making a safe space for creativity and bringing a sense of legitimacy to creativity, and its positive impact, is vital. Things that either challenge or enforce my views. I go into "question mode" and get obsessed. I'm very inquisitive. I often go down YouTube black holes researching things—everything from politics to Star Wars. Storytelling has been a consistent theme in my life. When I was young, I didn't think about what I wanted to be when I grew up. I thought about all the different people and characters I'd like to try being and maybe that's why acting was natural for me. What do you remember about the arts program at school? I attended Crofton House before I learned about the Byng Arts Program. I begged my parents to let me switch schools because I wanted to be an actress. Performing was cathartic for me. I loved making people laugh, dancing, acting, and my sister and I also sang competitive opera. My theatre teachers were Donna Welstein and Michael Green and we often stayed at school until 9/10 pm rehearsing before going home to do homework. They definitely taught me that being an artist/actress was a lot more hard work than glamour. What advice would you give young people to be prepared for the future? Having more connection to the outside world. I am also inclined to give advice to parents, which is to seek opportunities for their school-aged children in the real world: internships, co-ops, volunteering, etc. For young people, I would say that so much of life is about taking initiative and carving your own path. It is never too early to start. Don't wait for professional or learning opportunities to come to you... and try not to say no to the ones that do. If nothing else, you will always learn something!